Shoppers This Year May Need The Nudge Of Cold Air And Gift Cards It's been warmer than usual around the country and hardly feels like gift-giving season. Some economists say December sales will be fine after Christmas when consumers shop for sales with gift cards. 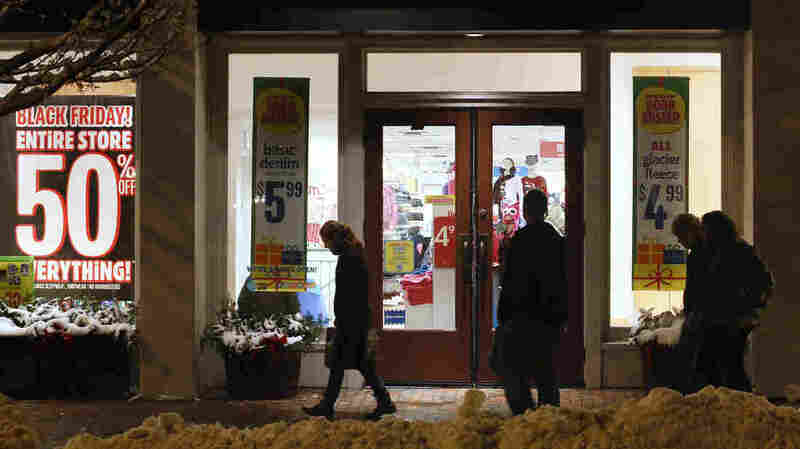 Shoppers in Freeport, Maine, pass by store windows advertising Black Friday deals after the stores opened their doors at midnight. Ever since gasoline prices tumbled and unemployment dropped this past fall, stores have been ready for people to come do their holiday shopping. According to government reports, cheap gas this year should have given consumers an extra $700 to spend. "But it hasn't had the effect of really increasing consumer spending all that much," says Chris Christopher, an economist with IHS Global Insight. In late November, when weak Black Friday numbers came out, it caused concern. Some doomsday economists went so far as to declare the holiday season a disaster. Other economists say Americans may be just spreading out their holiday shopping. "We've seen what used to be, historically, a single day gravitate towards late Thursday night store openings and then gravitating even earlier into the week," says Shawn DuBravac, an economist with the Consumer Technology Association. Instead of the infamous doorbuster sales with very limited quantity the day after Thanksgiving, stores are now offering larger inventory with less drastic discounts so that consumers don't have that rushed feeling. The effect is a broadening of the shopping season through November and December. Gus Faucher, an economist at PNC Financial Services, says even though Black Friday numbers weren't so big, he still expects many consumers to start spending their gas savings as chilly weather and Christmas draw closer and more people catch the spirit. "Consumers are feeling better about the way things are going. Things still aren't great but they're definitely headed in the right direction," Faucher says. When the cold weather hits, they will be buying mittens and boots. And on the final weekend of December — after Christmas Day — consumers will be armed with gift cards. DuBravac says retailers will capitalize on that with post-Christmas bargains. "Part of what they're trying to do is accelerate the redemption of those gift cards, and they're also trying to continue to leverage the momentum that exists around consumers and their willingness to spend," DuBravac says. Most economists figure that by the time it's all over, holiday retail sales will have gained a solid 3.5 percent over last year.